In a previous post we went through the key reactions of the carbocation pathway. It’s a family of reactions which proceed through 1) attack of an alkene upon an acid, forming a free carbocation, and 2) attack of a nucleophile upon the carbocation. Although we saw that several key reactions of alkenes were consistent with this mechanism, it isn’t the case for all. Take the bromination of alkenes, for instance. Treatment of an alkene with bromine (Br2) in a chlorinated solvent (CHCl3, and CH2Cl2 are popular choices; CCl4 is often cited in textbooks*) leads to the formation of products containing two bromine atoms. Possibly the most interesting feature of this reaction is that the products follow a very predictable stereochemical pattern. 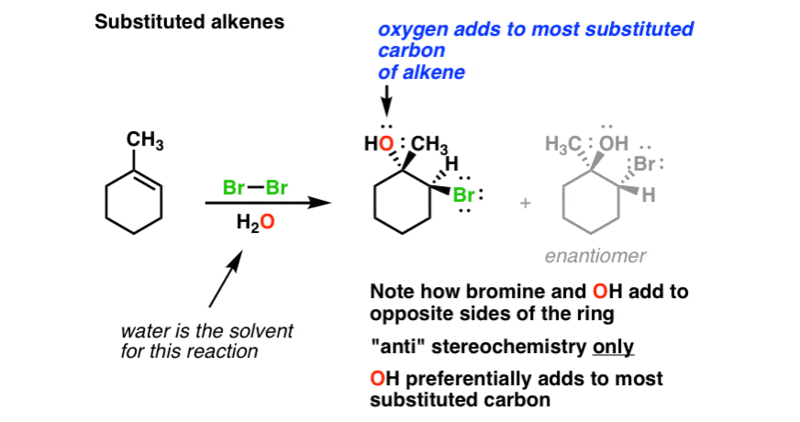 For instance, in the reaction of cyclohexene with Br2, the two bromine atoms add to opposite faces of the alkene (“anti” stereochemistry). No “syn” products are observed. What’s even more mysterious is that the stereochemistry of the starting alkene is directly related to the stereochemistry of the product. For instance if we treat cis-2-butene [aka (Z)-2-butene] with Br2, we get a mixture of enantiomers. 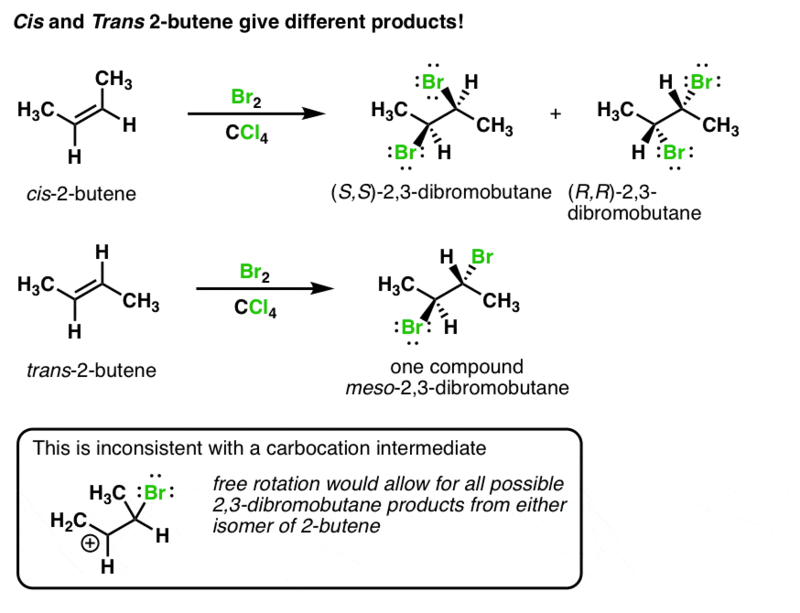 But if we treat trans-2-butene, we only get a single product (“meso” 2,3-dibromobutane). This property is called “stereospecificity” . What’s important about this? It’s inconsistent with a free carbocation! If there was a free carbocation, the stereochemistry of the starting alkene wouldn’t matter, since attack can come from either face. [Indeed, we know from labelling experiments that the reaction of H-Cl with cis or trans 2-butene is not stereospecific]. It’s also consistent with the absence of a free carbocation because rearrangements are never observed. For example, in the case below, we’d expect to see rearrangement (a 1,2-alkyl shift, to be precise) if a free carbocation was formed. Instead, note that the methyl groups stay in the same place. Here’s another experimental observation. The solvent matters. When we use water as the solvent for this reaction, we get the product below. [Note – this is called a “bromohydrin” since we have incorporated both bromine and water] . Note that the stereochemistry is still “anti”, as before. What this means is that somehow our solvent has intercepted a reactive intermediate in this reaction to produce the product above. (Note – this also occurs when we use alcohols as solvents; in these cases, ethers are obtained). What’s even more interesting is that the reaction is regioselective. That is, when we have an unsymmetrical alkene, the major product is the one where water has added to the most substituted carbon of the alkene [most substituted = the sp2 carbon of the alkene directly attached to the fewest hydrogen atoms]. Such so-called “Markovnikov” selectivity was also observed in the reactions that proceed along the “carbocation pathway”. So what’s going on? How can we explain these observations? In the next post we’ll go through the best hypothesis we have for the mechanism of this reaction. Or does the grey just mean it is the same product but flipped/rotated? The grey product is not the same molecule…there is no way to rotate it in three-dimensional space so it matches up with the product shown in black. They are stereoisomers, and furthermore, they are enantiomers or mirror images of each other. Does it matter if the solvent is polar protic or aprotic for bromination to occur? Such as Br2, THF adding to the alkene? Why alkene give alpha halo alcohol with bromine water while it gives bromo alkene with bromine and carbon tetra chloride? ?